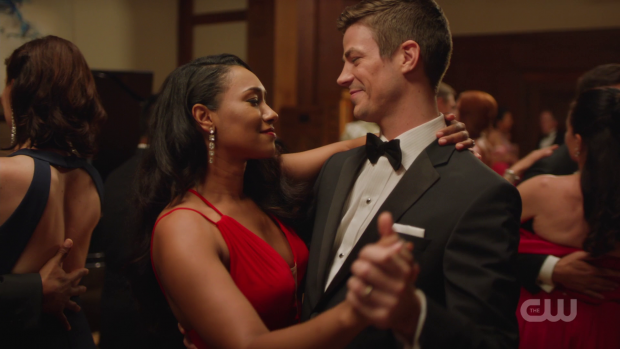 The Flash deals with family drama through the West-Allan family and Caitlin’s ongoing quest to find her father. I’ve said previously that I greatly appreciate the writers shifting gears where Caitlin is concerned. She has been adrift for quite some time and taken down some really nonsensical plot threads. Unfortunately the missteps of the Killer Frost side of her won’t go away and probably will come back but for now the unresolved feelings she has about her father is providing something new and interesting for Danielle Panabaker to play. This episode basically splits the cast in two with one group dealing with trying to find Caitlin’s father. On a plot level this is a lot of wheel spinning as the characters go from place to place looking for clues but ultimately finding nothing by the end. It’s not all that interesting because structurally it’s really formulaic. Basically they hit a dead end, Cisco vibes something in the room and they pursue that lead before repeating the same steps until eventually stumbling onto something resembling an answer. Behind this is some really engaging character drama. The writers basically retread the same ground with Caitlin agonising over her father not being the man she remembers him to be. In theory it’s interesting to have her perception of a man she thought was dead altered by discovering things he kept hidden but there’s really nothing here that hasn’t been covered in earlier episodes. Caitlin may come out of this with a little more information than she had before but emotionally she’s still in the same place so there has been no progression in that sense. Danielle Panabaker’s performance completely sells the growing sense of unease and confusion that Caitlin is feeling which does make the lack of significant emotional progression more palatable but it feels as if this has dragged on long enough. One thing that works brilliantly is the reinforcement of the Cisco/Caitlin friendship. This show has become more cluttered over the years which has caused a lot of things to slip. This season has so far managed to streamline the elements that make up The Flash to make everything less convoluted. Doing this allows for some of the best things from early in the life of the show to be almost rediscovered. Cisco and Caitlin’s friendship was really engaging early on so it’s great to see some focus given to that while making use of their current circumstances. The battle with Cicada has left Cisco with lingering injuries that make using his powers very painful. Despite that he doesn’t hesitate to use them so that Caitlin can get closer to finding her father. He keeps it a secret initially which is frustrating because there was a persistent problem of characters keeping secrets from one another for a long time but the secrecy doesn’t last long so it’s not detrimental. Cisco’s reason for keeping it a secret makes sense. He sees that Caitlin is hurting and knows that he has the ability to do something about that so he uses his powers and endures the pain so that he can help her. Eventually it gets too much for him and he collapses which causes Caitlin to find out what he has been hiding. Cisco’s main concern about being unable to support the team with his powers is that he may no longer be useful to them. He was used to being able to find answers by touching things and opening breaches to take people where they needed to go but he fears that his usefulness may be at an end if he can’t do that any more. The reality is that Cisco was invaluable before he had his powers because of his genius level intellect and ability to solve problems through a combination of ingenuity and technical know-how. It would seem that he has forgotten how useful that is which doesn’t quite work but makes some degree of sense in terms of the emotion of his conversation with Caitlin. It could be that he has retreated so far within himself that he feels as if his powers are the only useful thing he can bring to the table. Caitlin’s role is to shake him out of that and remind him of everything he has to offer as well as how valuable he is to her personally as a friend. His actions in this episode prove how heroic and selfless he is as he endures severe pain because Caitlin needs his help. This pays off when his restored self confidence allows him to get around the lost satellite problem by using the satellites that DeVoe launch. It’s an obvious solution when his mind isn’t clouded by crippling self doubt. Nora is settling into Joe and Cecille’s house and considers it a haven from Iris’ controlling nature. The reveal that Iris made the decision to suppress Nora’s powers and hide the truth about them from her explains Nora’s lack of connection with her mother and puts something that needs to be resolved in place. In order to deal with her resentment Nora has to realise the difference between the Iris she knows and the Iris native to this time period. They are basically two different people but Nora is unable to separate them as all she sees is the woman who lied to her and kept her at arm’s length. It makes sense from her point of view as she feels so badly betrayed that she can’t be objective. Talking to Cecille is what helps her get past this though I feel that Joe would have been better placed for this but I understand that isn’t possible given the current situation for the actor. Cecille tells her stories about Iris though attributes them to Barry in order to prove the point that she doesn’t really know either of her parents. Understanding the person that Iris is through learning details of her life. This opens up a dialogue between them that starts to get to the root of the issues that exist between them. Nora learns not to hold Iris’ future actions against here and try to come to a conclusion about her in the current time period. For reasons that are unknown Iris has noted some topics as off limits so Nora has a lot of curiosities that she isn’t allowed to ask about which will only widen the chasm between them and make Nora feel more isolated. Iris assures her that no topic is off limits as of this time period. That discuss us Iris diving off a roof to save Barry is enough for Nora to start seeing Iris in a different light. It now looks as if the healing has begun and their relationship will develop from here. 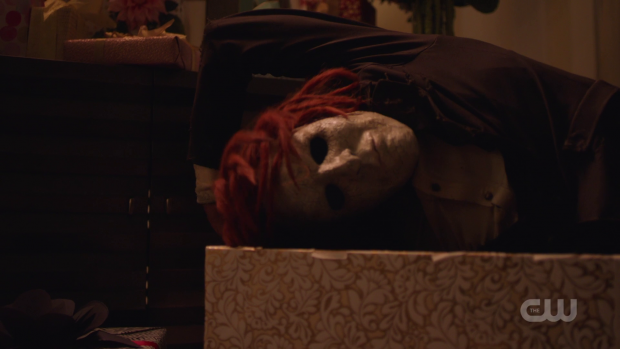 More so than any episode so far I feel that Nora’s presence acts as a commentary on the strengths and weaknesses of the show. Nora accuses Iris of being constantly condescending and WORD which echoes how I felt the character often comes across. Nora is from the future but the fact that she knows a version of Iris who embodies those negative traits suggests an acknowledgement of mistakes made in earlier seasons. There has been a significant improvement in her characterisation this season suggesting that the writers are consciously trying to rehabilitate her by giving her the opportunity to change who she becomes in the future by altering her behaviour in the present. It’s a good way to address past mistakes while making the change feel organic and letting her own that development. The villain of the episode was a pretty standard metahuman threat of the week though he didn’t have an awful lot of personality on his own other than the odd flourish in the scenes he appears. Most of his characterisation comes from his mother (Judith Maxie) talking about him and his motivation feels somewhat flimsy though he technically works as an example of less than harmonious family units as a contrast and comparison to the Barry/Iris/Nora it isn’t developed enough. The creep factor of his ability to contort was effective though an opportunity was missed to have him as the perfect opponent for Ralph who manages to defeat him off screen. Speaking of Ralph I was really impressed by his Spider-Man inspired method of travel and he is a far more engaging character than he was last season now that the writers have stopped trying to make him the comic relief to a frustrating degree. An enjoyable enough episode that spins its wheels on the Caitlin plot but makes great use of her friendship with Cisco and moves the Iris/Nora dynamic forward by having them begin to reach an understanding. 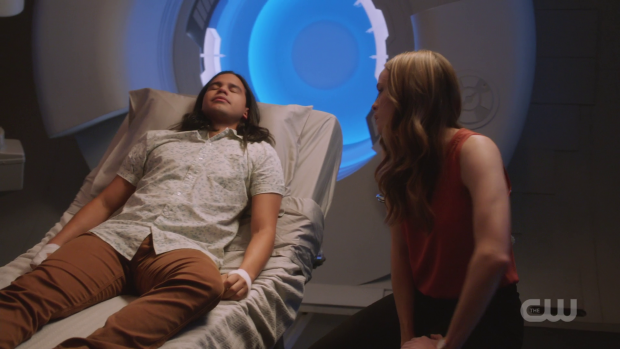 The structure of Caitlin’s investigation into her father was really formulaic to the point that it was uninteresting but Cisco doubting his usefulness to the team with the reduced effectiveness of his powers is handled well because Caitlin is there to remind him how much he’s worth to Team Flash and to her. This pays off when he sees past his self doubt to find a solution to the satellite problem. The Nora and Iris dynamic moves on when Cecille tricks Nora into hearing stories about Iris by telling her that they are actually about Barry. This helps Nora see her mother in a different light and encourages her not to hold her behaviour in the future against her in this time period. This understanding helps them gain some common ground and lets their relationship move forward. Nora’s very presence in the show could serve as a commentary on past mistakes made with Iris as a character and create an opportunity for them to be solved in a way that lets Iris own that development. The villain of the week was fairly standard as these things go though completely lacking in character outside of some flourishes in scenes he appears in and exposition from his mother. There was a missed opportunity to give Ralph a foe with similar powers as Ralph defeats him off screen and the less than harmonious family idea that connects to the Iris/Nora/Barry dynamic but it isn’t developed enough so doesn’t work.